Condition: New ปิ๊กการ์ดกีตาร์เฟนเดอร์เทเลสแตนดาร์ดสีดำFender Standard Tele-Telecaster Pickguard 3-ply BlackFender part number 09913560008 mounting screw holes3-ply black pearlFits American Series/Standard/Deluxe/Special and Highway 1™ (USA) Road Worn®, Player, Blacktop, Standard, and Deluxe (Mexico), and Squier® Standard Series (2004-current) models.One of the really nice things about Fender® instruments is that you can change the look of your instrument with relative ease. One of th.. Condition: New ปิ๊กการ์ดกีตาร์เฟนเดอร์เทเลสแตนดาร์ดสีขาวFender Standard Tele-Telecaster Pickguard 3-ply White Fender part number 09913550008 mounting screw holes3-ply black pearlFits American Series/Standard/Deluxe/Special and Highway 1™ (USA) Road Worn®, Player, Blacktop, Standard, and Deluxe (Mexico), and Squier® Standard Series (2004-current) models.One of the really nice things about Fender® instruments is that you can change the look of your instrument with relative ease. On.. 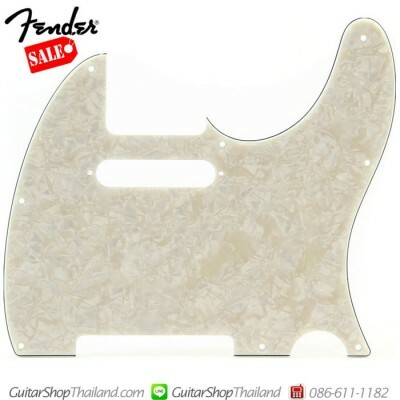 Condition: New ปิ๊กการ์ดกีตาร์เฟนเดอร์เทเลสแตนดาร์ดมุขครีมFender Standard Tele-Telecaster Pickguard 4-ply Aged White PearlFender part number 0992174000-8 mounting screw holes-4-ply Aged White PearlFits American Series/Standard/Deluxe/Special and Highway 1™ (USA) Road Worn®, Player, Blacktop, Standard, and Deluxe (Mexico), and Squier® Standard Series (2004-current) models.One of the really nice things about Fender® instruments is that you can change the look of your instrument with rel.. 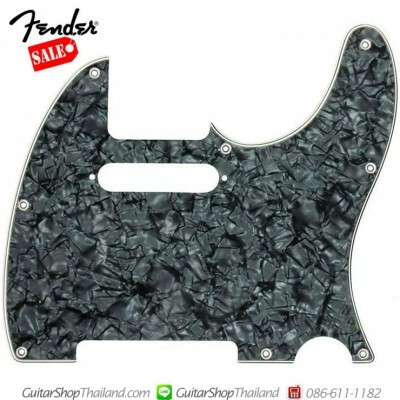 Condition: New ปิ๊กการ์ดกีตาร์เฟนเดอร์เทเลสแตนดาร์ดสีมุขดำFender Standard Tele-Telecaster Pickguard 4-ply Black Pearl Fender part number 0992151000-8 mounting screw holes-4-ply black pearlFits American Series/Standard/Deluxe/Special and Highway 1™ (USA) Road Worn®, Player, Blacktop, Standard, and Deluxe (Mexico), and Squier® Standard Series (2004-current) models.One of the really nice things about Fender® instruments is that you can change the look of your instrument with relative eas.. 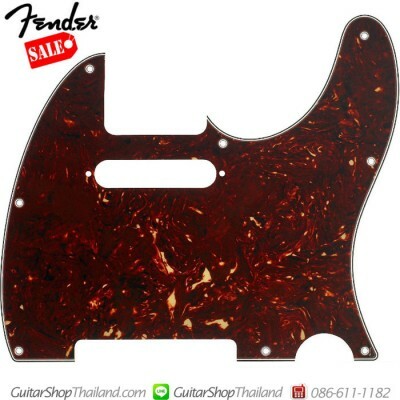 Condition: New ปิ๊กการ์ดกีตาร์เฟนเดอร์เทเลสแตนดาร์ดสีกระFender Standard Tele-Telecaster Pickguard 4-ply Tortoiseshell Fender part number 0992152000-8 mounting screw holes-4-ply black pearlFits American Series/Standard/Deluxe/Special and Highway 1™ (USA) Road Worn®, Player, Blacktop, Standard, and Deluxe (Mexico), and Squier® Standard Series (2004-current) models.One of the really nice things about Fender® instruments is that you can change the look of your instrument with relative eas.. 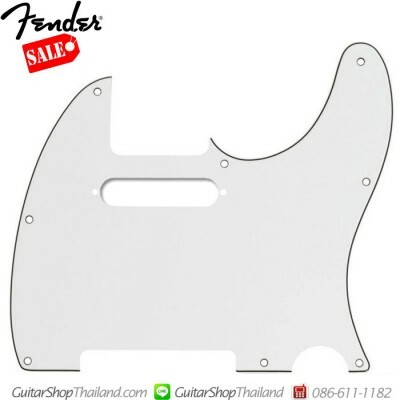 Condition: New ปิ๊กการ์ดกีตาร์เฟนเดอร์เทเลสแตนดาร์ดมุขขาวFender Standard Tele-Telecaster Pickguard 4-ply White PearlFender part number 099-2150-000-8 mounting screw holes-4-ply White pearlFits American Series/Standard/Deluxe/Special and Highway 1™ (USA) Road Worn®, Player, Blacktop, Standard, and Deluxe (Mexico), and Squier® Standard Series (2004-current) models.One of the really nice things about Fender® instruments is that you can change the look of your instrument with relative eas.. Condition: New ปิ๊กการ์ดกีตาร์เทเลlสีขาวหม่นStandard Tele® Telecaster® 8-Hole Mount 3-Ply PickguardMade in Korea*รูน็อตตรงสำหรับกีตาร์เฟนเดอร์ *บางรุ่น*กรุณาตรวจสอบขนาดและรายละเอียดของสินค้าให้แน่ใจว่าตรงกับสิ่งที่ท่านต้องการก่อนทำการสั่งซื้อ .. 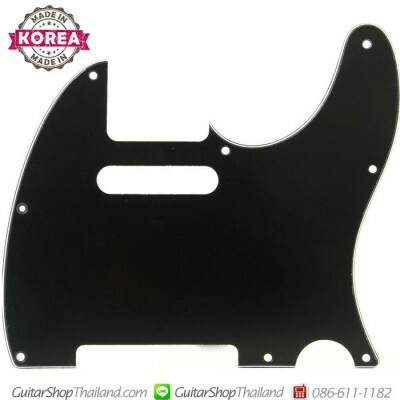 Condition: New ปิ๊กการ์ดกีตาร์เทเลสีดำStandard Tele® Telecaster® 8-Hole Mount 3-Ply Pickguard BlackMade in Korea*รูน็อตตรงสำหรับกีตาร์เฟนเดอร์ *บางรุ่น*กรุณาตรวจสอบขนาดและรายละเอียดของสินค้าให้แน่ใจว่าตรงกับสิ่งที่ท่านต้องการก่อนทำการสั่งซื้อ .. 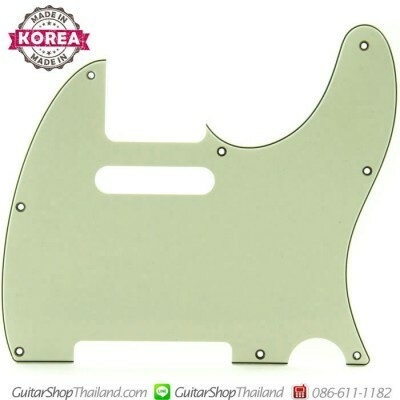 Condition: New ปิ๊กการ์ดกีตาร์เทเลสีมิ้นStandard Tele® Telecaster® 8-Hole Mount 3-Ply Pickguard Mint GreenMade in Korea*รูน็อตตรงสำหรับกีตาร์เฟนเดอร์ *บางรุ่น*กรุณาตรวจสอบขนาดและรายละเอียดของสินค้าให้แน่ใจว่าตรงกับสิ่งที่ท่านต้องการก่อนทำการสั่งซื้อ .. 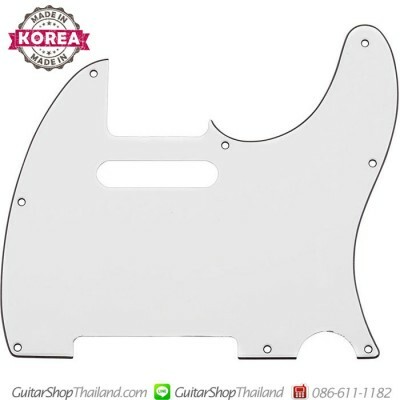 Condition: New ปิ๊กการ์ดกีตาร์เทเลสีขาวStandard Tele® Telecaster® 8-Hole Mount, White, 3-Ply PickguardMade in Korea*รูน็อตตรงสำหรับกีตาร์เฟนเดอร์ *บางรุ่น *กรุณาตรวจสอบขนาดและรายละเอียดของสินค้าให้แน่ใจว่าตรงกับสิ่งที่ท่านต้องการก่อนทำการสั่งซื้อ .. Condition: New ปิ๊กการ์ดกีตาร์ทเลสีดำ 52' 5รูHOSCO TC-BL-B1P Tele-Telecaster PickguardIn 1950's, Bakelite was popular material for electric pickguards, but it disappered in 1960's. Our bakelite pickguards are for vintage lovers. 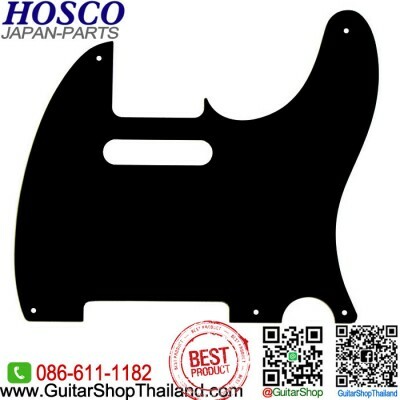 Thickness : 2.0 mmBrand:HoscoModel: H-TC-BL-B1PFinish: 1-Ply BlackMounting Holes 5Made In: Japanhttp://www.hosco.co.jp/HOSCO_ENGLISH/en-top.html*กรุณาตรวจสอบขนาดและรายละเอียดของสินค้าให้แน่ใจว่าตรงกับสิ่งที่ท่านต้องการก่อนทำการสั่งซื้อ ..